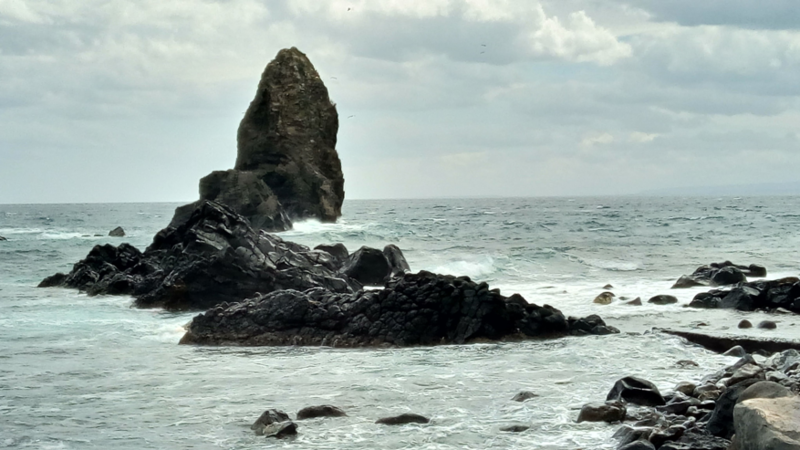 Catania and the surrounding region had been plagued by earthquakes that had destroyed the many different architectural sites of past artistic movements. What is depicted here is the Cathedral of Sant’Agata. 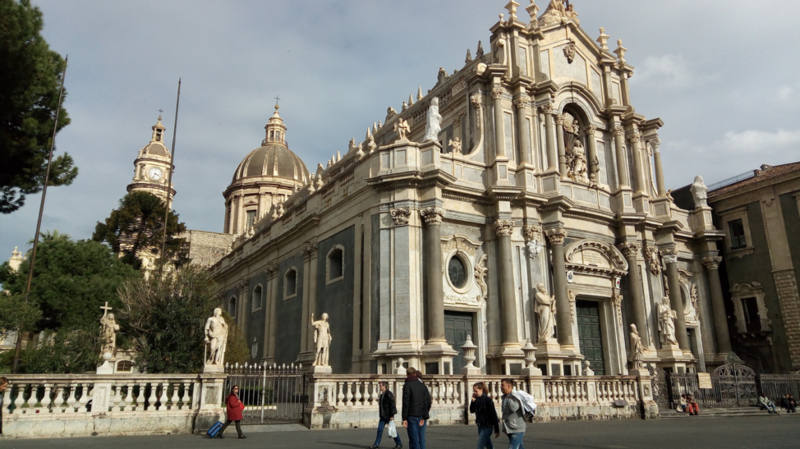 It is a beautiful baroque church with dramatic curves and movement that made me fall in love. I felt boujee, to use appropriate modern-day slang. Bad and boujee to be exact. I was eating a gelato while taking this all in. My feet were in pain, but it didn’t matter. The high I felt in the moment alleviated my feet from whatever strain they had undergone in this journey. On this trip no diets existed and the idea of one seemed foreign prior so to those of you wondering what my diet consisted of on this trip, don’t worry. The result of my choices was and continues to be happiness. Now that that has been covered, let’s talk about the food that has been nourishing me with the energy to type away. 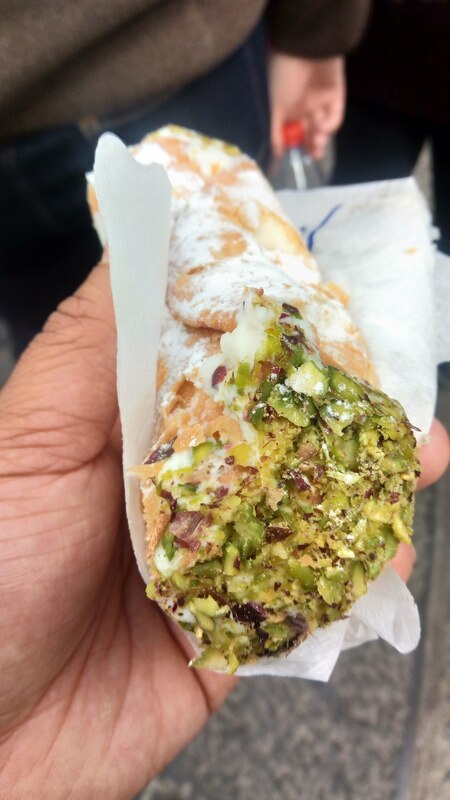 Il cannolo siciliano is art. A nice hard shell filled with a ricotta cream. If that does not have your mouth watering, please close this tab. I have avoided cannoli (the plural in Italian not cannolis!!!) for a while because I thought it would be best to get them from their home, Sicily. I did not realize how addictive they would become. I gave César my wallet to hold with the excuse that I did not want to carry it around, the truth that I have been withholding from him is that I wanted him to hold it because I did not want to blow away my money on cannoli. I constantly think about giving all my possessions in exchange for cannoli. I was not aware that some towns were completely covered by fog. I had thought this was only a thing seen in horror films to give an ominous feeling. 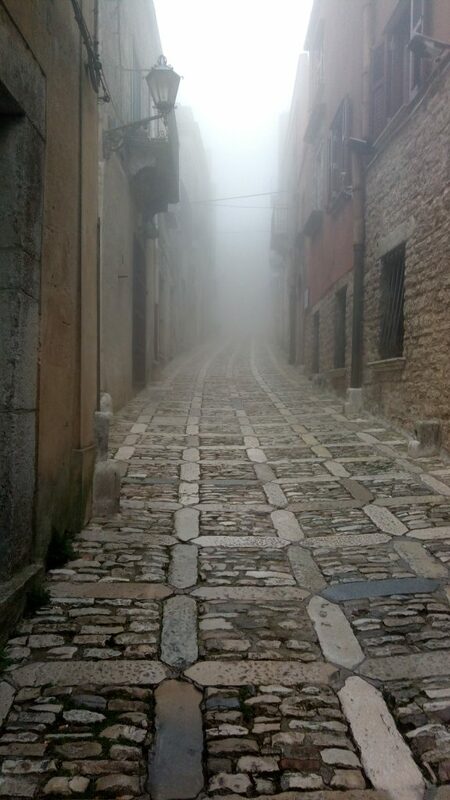 We spent a day in Erice, this mountain town of about 150 people. 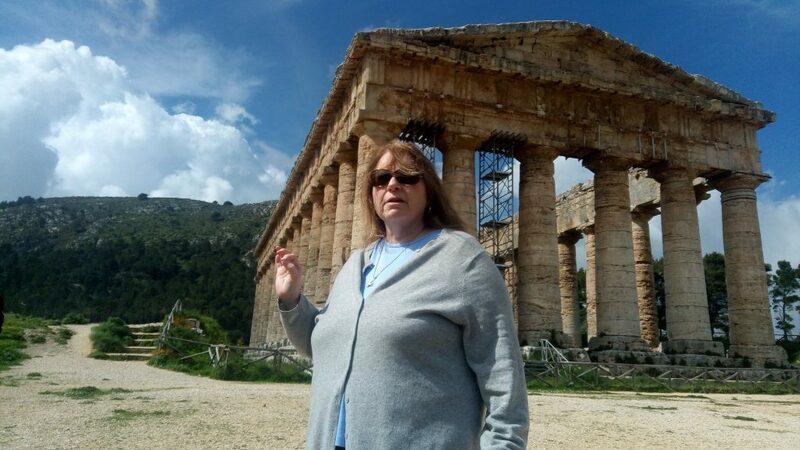 We arrived in the afternoon after a long day of driving and stopping at a few archaeological sites along the road. Once I dropped off my bags in the hotel, I went on a walk around the town. I heard voices in all directions, but I couldn’t find what was producing it. I kept walking straight for a good 10 min unable to see beyond 5 meters in front of me. I was alone, lost and enveloped by the fog. I guess if I were to die a death in a mountain town in the island of Sicily, after having consumed a bunch of cannoli, wouldn’t have been so bad considering how happy I was. They would’ve probably made a movie or a short story. 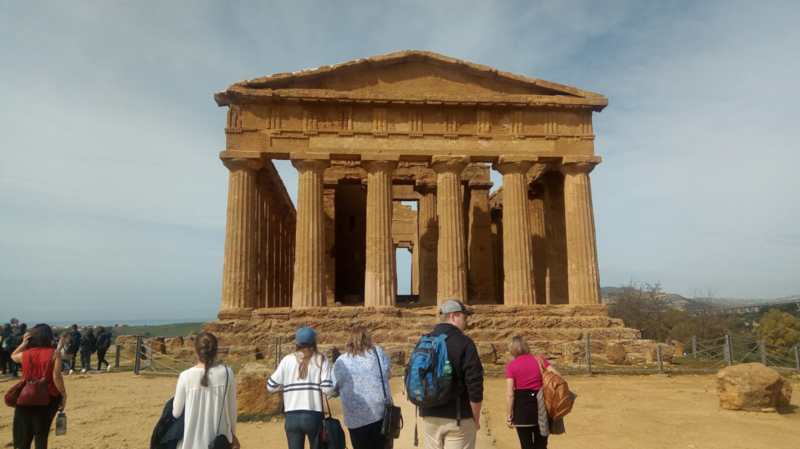 I’m going to stop entertaining this idea… In addition to being in the middle of nowhere, we met an interesting nun turned baker/cook who taught us how to make marzipan, le tette and other Sicilian sweets before stuffing us with an array of Sicilian delights. I asked if I could work for her over the summer and she said sure. I hope she knows I was not joking and that she should expect a call or an email at any moment.